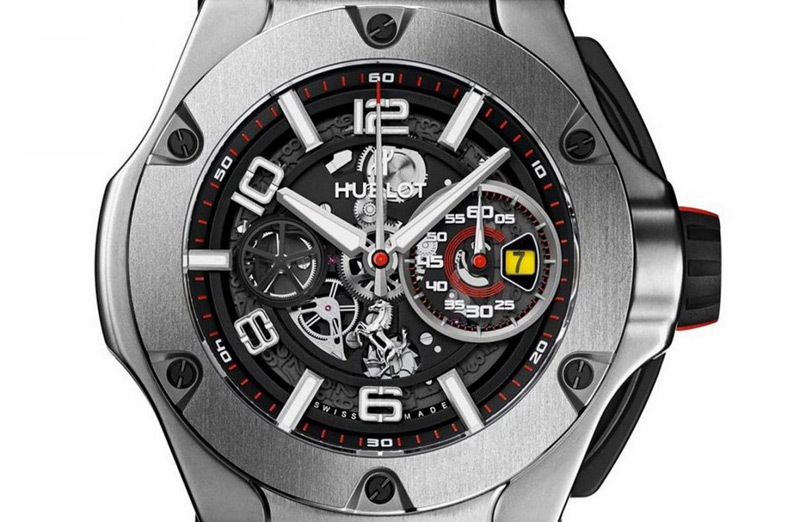 In 2011 Hublot teamed up with Ferrari to share the constant quest for innovation, excellence and performance and to brand its watches with the Ferrari logo and the famous prancing horse. The Big Bang Ferrari is no exception. 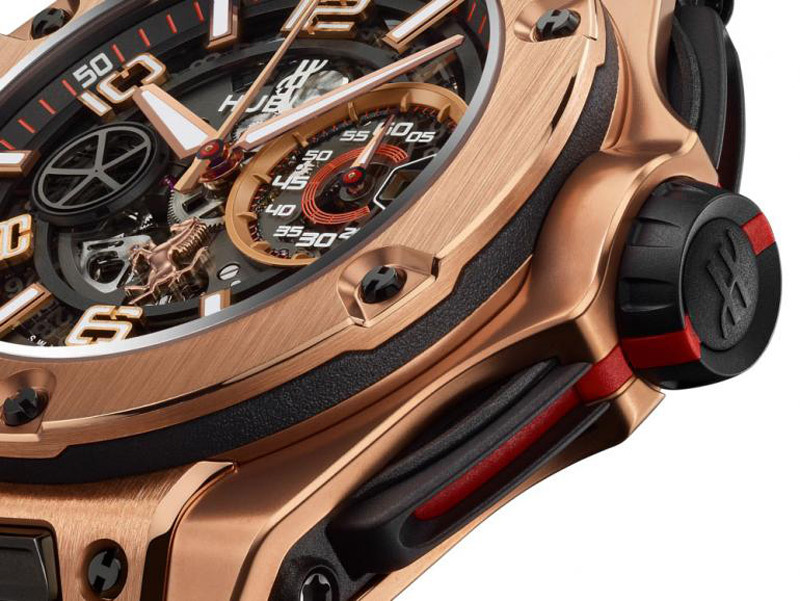 Taking inspiration from the innovative volumes and iconic design of the most recent Ferrari models, Ferrari and Hublot have redesigned the contours of the Big Bang Unico model. The minute counter and date window at 3 o’clock are designed like a car tachometer and style of the date is inspired by a Ferrari speed dial. The Prancing Horse logo features discreetly at 6 o’clock. At 9 o’clock, the seconds counter is in the shape of an air extractor. The hour and minute hands, which have been completely redesigned, offer improved readability. Instead of being positioned horizontally, the numerals are now positioned in line with the indices, which seem to float above the dial, giving the whole piece a 3D look. 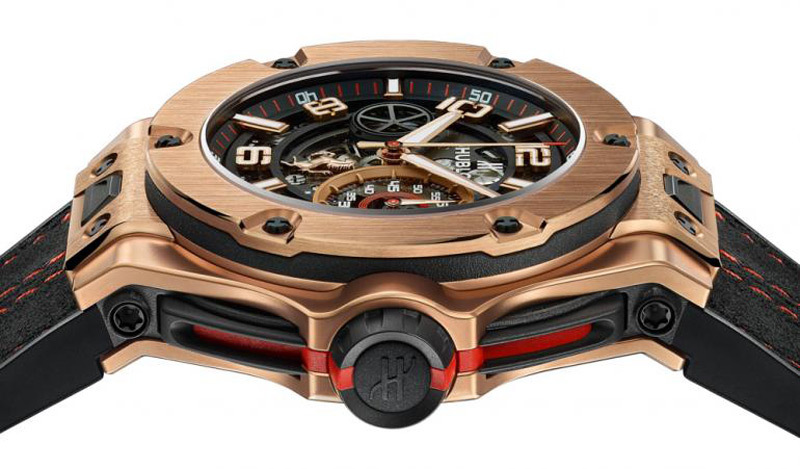 The Big Bang Ferrari is equipped with a Unico movement – the Hublot Manufacture movement that integrates a flyback chronograph with column wheel positioned on the dial side. The oscillating weight echoes the iconic star spoke design of the Ferrari wheel rims, while the main plate, bridges and oscillating weight are all treated with black PVD and can be seen through the dial and sapphire case-back.